There's a story about how this noodle dish came to be. But it's not about alcohol being infused into the dish but about a drunk and starving husband coming home and demanding his wife to prepare food for him. 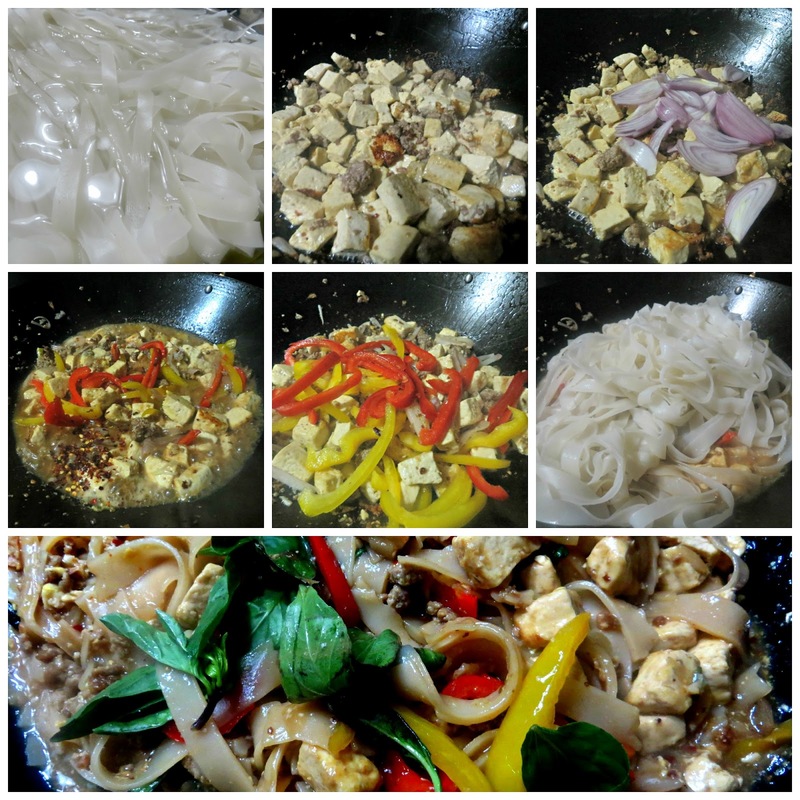 The wife just gathered whatever is available in the kitchen and the result is flat noodles with a spicy, salty and sweet sauce with bell peppers and herbs. I'm not sure if these are really the components but this is how they make it in the Thai restaurants where we order it from. It's easy mixing the sauce and sautéing the meat or tofu but perfect noodles is somewhat tricky to achieve as you can easily overcook it if you don't keep an eye on it. I hate soggy noodles and I have to emphasize that every time I order noodles in a restaurant. So I soak the noodles in boiling water for twelve minutes and then finish the cooking process as as I toss it in the wok with the sauce and the veggies. Heat oil in wok over medium heat. Brown the ground chicken followed by the tofu. Continue stir frying until tofu starts to brown a little. Add garlic, onion and Thai chilies. Stir fry for a minute. Add fish sauce, soy sauce, oyster sauce and palm sugar. Stir fry for 2 minutes then add the bell peppers. Continue stir frying for 2 to 3 until the vegetables are soft. I also had very hot broth on stand-by just in case the noodles absorb all the liquid too fast and it becomes a bit dry and I need more liquid. I’m so happy It really tasted like Pad Kee Mao despite using oyster sauce instead of Golden Mountain sauce. But I will definitely add it to my pantry soon. I think it is the absence of Thai basil leaves which will unmake the dish. Every Thai dish will be bland without it, IMO. I don’t see my love for Thai food waning at all as there’s so much more to explore in Thai cuisine and I barely started.